For centuries, this seafaring breed existed everywhere along the coast of Portugal and is considered a purely Portuguese breed. Owing to modifications in the fishing systems used, the breed has become restricted to the province of Algarve which should be considered its home. It was prized by fishermen for its spirited yet obedient nature and a robust, medium build that allowed for a full day’s work in and out of the water. 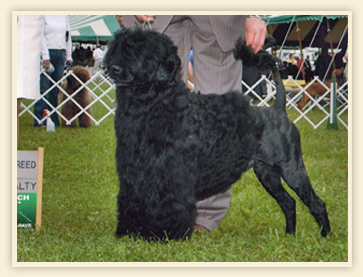 The Portuguese Water Dog is an athletic swimmer and diver of exceptional ability and stamina. He aided his master at sea by retrieving gear and broken nets, herding schools of fish and carrying messages between boats and to the shore. 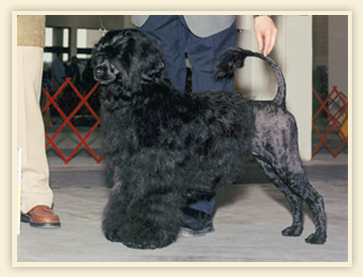 The Portuguese Water Dog is defined by his job. He has hard, penetrating and attentive expression, splendid sight and a fair nose. 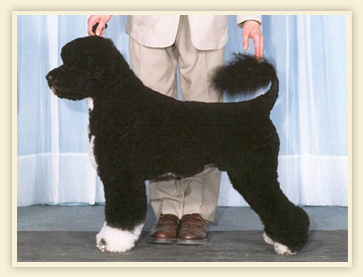 Slightly longer than tall, he is a medium-sized, sturdy, athletic swimming dog with webbed feet, short neck, and a wavy or curly coat to protect him from the elements, whether in the water or on land. From his impressive head with piercing gaze through a rugged body to his powerful tail carried up in a ring with its characteristic flowing flag, he presents an indelible impression of strength, spirit and soundness. An animal of spirited disposition he is self-willed, brave and very resistant to fatigue. Exceptionally intelligent and a loyal companion, he does his job with facility and obvious pleasure. Seen in profile it is slightly longer than the muzzle, its curvature more accentuated at the back than in front and it possesses a well defined occiput. From the front the parietal bones are seen to be dome-shaped and to have a slight depression in the middle. The forehead has a central furrow for two thirds of the length of the parietals and the frontal bones are prominent. Is narrower at the nose than at its base. The stop, which is well defined, is slightly further back the inner corner of the eyes. Wide. Nostrils well open and finely pigmented. 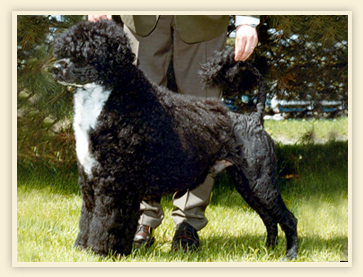 Black, in animals with black, black and white or white coats. In browns the nose is of the same colour as the coat. Thick, especially in front. Inner corner of lips not apparent. Mucous membrane (roof of mouth, under the tongue and gums) well ticked with black or quite black. Strong and neither over nor undershot. Not apparent. Canines strongly developed. Medium sized, set well apart and a bit obliquely, roundish and neither prominent nor sunken. Brown or black in colour. The eyelids, which are of fine texture have black edges. No haw. Leather heart-shaped, thin in texture and set well above the line of the eyes. Except for a small opening at the back, the ears are held nicely against the head. The tips should not reach below the beginning of the neck. Straight, short, nicely rounded and held high. Strongly muscled. No mane and no dewlap. Wide and deep, reaching down to the elbow. Ribs long and well sprung. Withers: Wide and not prominent. Back: Short and nicely joined to the croup. Abdomen: Held well up in a graceful line. Croup: Well formed and only slightly inclined with hips hardly apparent. Not docked, thick at the base and tapering; medium setting. It should not reach down below the hock. 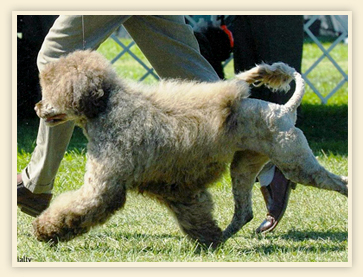 When the dog is attentive the tail should be held in a ring, the front of which should not reach beyond the line of the kidneys. The tail is of great help when swimming and diving. Strong and straight. Shoulder: Well inclined and very strongly muscled. Upper Arm: Strong and of regular length, parallel to the medial body line. Forearm: Long and strongly muscled. Knee: Heavy boned, wider in front than at the side. Pastern: Long and strong. Round and rather flat. Toes not too knuckled up and not too long. The membrane between the toes, which reaches the lip of these, is of soft skin, well covered with hair. Black nails are preferred but whites, browns and striped are allowed according to the colour of the coat. Nails held up slightly off the ground. Central pad very thick, others normal. Straight and very strongly muscled. Thigh: Strong and of regular length. Very strongly muscled. Thigh bone parallel to the medial bodyline. Second Thigh: Long and strongly muscled, parallel the medial body line. Decidedly inclined from front to back. All the tendons well developed. Buttocks: Long and well curved. Similar, in all respects, to the fore feet. Regular. 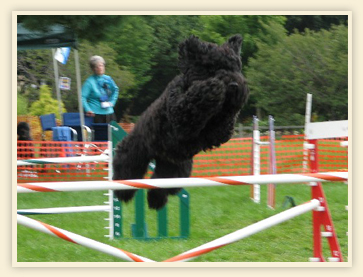 It is admissible for the front legs to be held so that feet are slightly in front of the perpendicular and the back legs, from the hock downwards, also a bit forward. 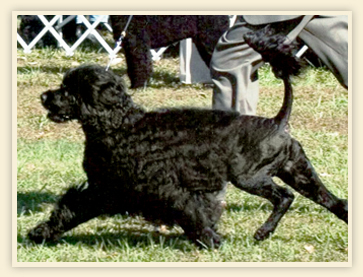 First and foremost a working dog, the Portuguese Water Dog’s trotting gait should be effortless, balanced and sound. He should display a proud carriage and a light, happy attitude with the tail carried high in ring over the back. He should be gaited at a moderate speed. There should be good reach and strong drive with a level topline. At increased speed there will be tendency to converge. Movement from front and rear will be clean and true. The walking gait is light with short steps and the gallop energetic. Profuse coat, of strong hair, covering the whole body evenly, except for the under-arms and groin where it is thinner. 1. The hair is fairly long, wavy, rather loose with a slight sheen. The hair on the top of the head is upright and that on the ears decidedly longer than the leather. 2. 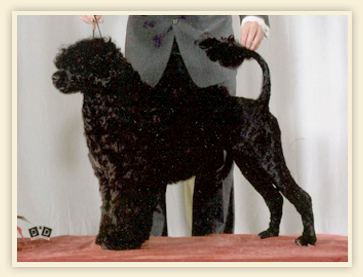 The hair is shorter, forms compact cylindrical curls, thickly planted and somewhat lusterless. On the top of the head the hair is similar to that of the rest of the coat. Whereas that on the ears is sometimes wavy. Colours are black, white and various tones of brown; also combinations of black, or brown with white. A white coat does not imply albinism provided nose, mouth and eyelids are black. 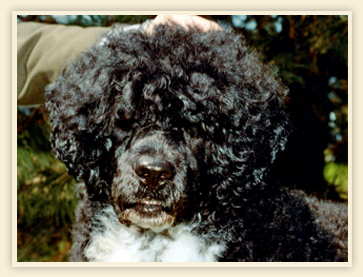 In animals with black, white or black and white coats, the skin is decidedly bluish. There is no undercoat. 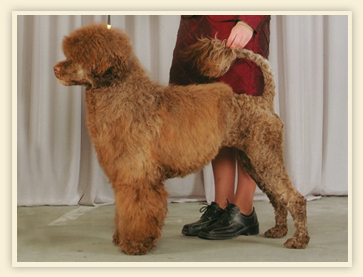 The middle part and hind quarters, as well as the muzzle, must be clipped. The rest of the coat must be left long. The hair on the end of the tail must be left at full length. The entire coat is scissored or clipped to follow the outline of the dog leaving a short blanket of coat appearing no more than one inch in length. The hair on the end of the tail must be left at full length. Hair on the ears is trimmed to the leathers. and which therefore cannot be overlooked. Copyright © 2019 Roslyn Eskind Associates. All rights reserved.